How Much Wort Should Batch Spargers Collect? 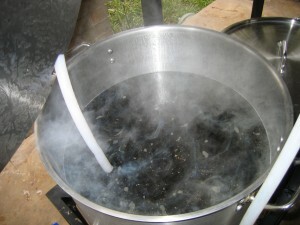 Wort being collected in a kettle. With continuous sparging, there is an optimal volume of wort that can be collected from a given weight of malted grain. If a brewer collects less than this amount, he is leaving sugars behind in the grain bed. If he exceeds this amount, he will get more sugars, but at the expense of extracting excess tannins from the grain husks, which will make his beer astringent. On my system, this happens around 0.65 gallons of wort per pound of grain. The exact volume varies (although not by much) and this is something a serious continuously-sparging homebrewer should determine for himself on his own system. But what about batch spargers? There are at least a few different ways that batch spargers approach wort collection. The simplest possible way to batch sparge would be to mash at a reasonable mash thickness, recirculate and then drain the first wort. Then, the first dose of sparge water would be added such that the liquid level in the mash/lauter tun equals the level in the first mash. Then the wort would be recirculated and collected again. This would yield first and second worts of equal volume. This could be repeated once more to yield a third volume of wort. At a mash thickness of 1.25 quarts of water per pound of grain (2.6 L/kg), and assuming the grains absorbs 0.12 gallons of wort per pound, the amount of wort collected is 0.39 gallons per pound for 1 dose of sparge water or 0.58 gallons per pound for 2 doses of sparge water. (This also assumes no dead spaces in the mash/lauter tun.) If you decrease the mash thickness to 1.5 qts./lb. (3.1 L/kg), the amounts of wort change to 0.54 gallons per pound for 1 dose of sparge water (and 0.80 gallons/lb. for 2 doses; this is likely to be too dilute in many cases). Whatever the values, the amount of wort collected would be tied to the amount of grain in the grist. As a consequence, your extract efficiency would be the same no matter the size of your grain bill. At lower grain bill weights, the brewer may need to add water to either the kettle or to the mash and sparge water volumes to yield a reasonable pre-boil wort volume. And this is common practice. Frequently, after the mash is finished, an additional dose of water is added before draining the first wort. Sufficient sparge water is then added so that the volume of second wort equals the volume of first wort collected and the target pre-boil volume is obtained. No one knows how much wort can be collected by batch sparging from a given weight of grain without extracting excess tannins. However, sticking to a maximum of around 0.65 gallons/pound (the continuous sparge ratio) should be safe. To do this, multiply the weight of the grain bed (in pounds) by 0.65 gallons/lb. to yield the volume of wort to collect. (Or, use the table I posted yesterday.) If this is lower than a reasonable pre-boil volume (one that can be boiled down to your batch volume in 60–90 minutes), add water to the kettle to yield a reasonable amount. Given the mechanics of batch sparging, it’s possible you could collect more wort and not extract excess tannins, but this should give a limit that’s known to be safe. At higher grain bill weights, the wort can be boiled for extended amounts of time. Or, the brewer can limit the number of times sparge water is added or the volume of sparge water to yield a lesser pre-wort volume. Lowering the amount of sparge water, however, will also lower your extract efficiency. So, if you collect your wort by batch sparging, with a reasonable mash thickness you can collect either two or three worts from your grain bed and not oversparge the grains. (The amount of sugars recovered with the second dose of sparge water is low and many batch spargers skip the collecting the third wort, even though it lowers their extract efficiency slightly.) By adding water to the mash and sparge water additions, you can hit a reasonable pre-boil wort volume when you have a smaller grain bed. For very small grain beds, adding water to the kettle may be better. If you are mashing a lot of grain, you can either boil for an extended amount of time or limit the number or volume of sparge water additions to lower the pre-boil volume and shorten your boil time. I was wondering what you thought of the practice of one batch sprage and topping off the fermented with cold bottled H2O. It helps to cool my wort much faster. That’s an interesting twist. If you need “cooling power” more than the small amount of extract efficiency you’ll lose from not adding the water as sparge water, it seems like a good idea. My process uses either BIAB or batch sparging. For BS (that’s a poor acronym!) I begin by calculating how much water I need, which is easy knowing the batch size, final gravity, and boil off rate. The only other thing I need to know is how much water will be absorbed in the grain. I have written Excel code which completes an iterative program to calculate the grain requirements and hence the water that will be lost in the grain. I split this water into two equal volumes, one for each sparge. The bottom line for me is that my final runnings are always well above 1.010 sg, which is the supposed point of concern. In fact I am usually at 1.020 or so, with brew house efficiencies usually around 75%. I routinely batch sparge in two equal sparges and collect 8 gallons to allow for a boil-off of about 2.5 gallons in 90-100 minutes. Even on batches with grain bills as small as 9 lbs and a water/grist ratio of 1.3:1, I also see final runnings around 1.020 with pH in the 5.4-5.6 range (with 5.8 being the usual cited threshold for tannin extraction). Is the reason for this that the sugar and buffer capacity of the second batch sparge is spread rather equally throughout the entire volume of the batch (approx. 3 gallons) instead of the gradual gravity decrease/pH increase of a stream of runnings from a continuous sparge? And does that explain how it’s possible to achieve higher-gravity/lower-pH runnings even at wort collection ratios higher than 0.65 gal/lb? What you have said is indeed what batch sparge advocates claim. And, the explanation makes sense with regards to the constant specific gravity of the second batch of wort and the lower pH (compared to the final runnings in a continuously sparged beer). It even explains the slightly lower extract efficiency seen with batch sparging. (If your second batch is SG 1.020, you left some sugar behind compared to a fly sparger who rinses the grain bed such the his final runnings are around 1.010.) However, this hasn’t been tested to any significant degree (unless I’ve missed something, which is possible). And interesting experiment would be to take a grain bed of a given weight and see how dilute you would need to get (what volume to weight ratio) to yield a second batch sparged wort around pH 5.7 (just below the “danger zone”). This could be done on very small mashes (around a pound, or even less). I might have to try that sometime. So the idea is to have a constant thickness between your conversion step and your sparge? I usually mash to 1.25 or 1.3 qt/lb for conversion, then for the sparge just add whatever volume of water is needed to get me to my pre boil kettle volume. This has presented efficiency problems for me in higher gravity beers because the sparge water required is much less than the initial amount required for conversion. I can’t test for pH yet, so that isn’t an option for me at this time. Should I be keeping the thickness the same for all sparges? If so, the i would end up with a higher pre boil volume, which will just require me to boil longer, correct? Collecting a first and second wort of the same volume helps with extract efficiency (or at least, that’s what they say). Having a mash thickness that is the same for both batches accomplishes this. For higher-gravity beers, you’ll either need to boil more wort or just accept a lower extract efficiency (from using less sparge water to collect the second wort). Are there negatives to collecting more wort from a single batch sparge infusion compared to first runnings? Or asked another way, what are the advantages of collecting multiple sparge runoffs if you don’t reach 0.65gal * lb grain after first and second wort vs. collecting enough second wort to hit the mark? That’s a good question. I can’t see how it would make much of a difference, but that doesn’t mean it wouldn’t. What about the volume of wort absorbed by hops? You can lose a lot when doing an IPA or DIPA. That’s an additional factor to consider, outside of the amount of wort to collect based on the size of the grain bill. For a very hoppy beer, I sometimes scale my batch size up slightly, with the idea that I’ll lose some volume to hops and thus yield my normal batch size. These articles are very helpful! I came looking for reading on my sparge method in moving to a RIMS and enjoyed the level of detail of the discussion on the AG process in general. I’m trying to think how/why you ever get above the original 0.3125gal per pound of grain, much less after we take absorption into account in the mash. Thanks for the info! The 0.39 gal/lb. is the total amount of wort you’d end up with if you mashed at 1.25 qts/lb. mash thickness and collected two worts (first wort and one sparged wort, at the same mash thickness). The dry grains would absorb some water (0.12 gallons per pound) in the mash, but the wet grains wouldn’t for the first addition of sparge water.